Nitrogen deficiency results in pale green leaves with symptoms first appearing on the older leaves (see picture). Severe deficiency will result in the entire plant showing symptoms. In addition, growth of the plant is stunted and the development of vegetative branches reduced. Bolls may be shed soon after flowering. When N deficiency occurs later in the season, leafs may turn purple, and bolls at late fruiting positions may be shed [N31]. 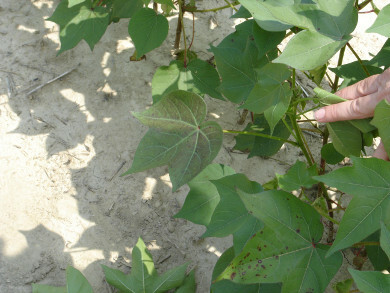 A healthy (left) and a nitrogen deficient cotton leaf (right; photo provided by the International Plant Nutrition Institute. While insufficient N often reduces crop growth and lint yield, excessive N can cause difficulties in defoliation, harvest, and may reduce lint yield [N15]. Furthermore, high N application rates may increase aphid populations. In a FREP-funded study carried out in the San Joaquin Valley, cotton aphid infestations were more severe with 200 lbs N/acre than with lower N application rates [N11]. Aphid levels were especially high in plots where high N rates and the pyrethroid insecticide Capture (to control lygus bug populations) were applied. Soil samples for nitrate analysis should be taken near planting time or at least 3 weeks after the last N application [N31]. As cotton is a deep rooting crop, samples should be taken to a depth of at least two feet. The distribution of nitrate in the soil profile is very variable. For this reason, the estimation of the potentially available N is improved by taking samples deeper than 2 feet [N16]. The Cotton Production Manual recommends taking samples from the top 3 feet of soil [N31]. Due to the variability of nitrate in the soil, care must be taken that the sample is representative for the field (see Sampling for Soil Nitrate Determination). The soil nitrate test provides information on plant available N at the time of sampling. Its level depends on a number of factors (see Factors Affecting Soil Nitrate Concentrations in Spring). Therefore, the test result is field specific and needs to be determined every year. In a FREP-supported study carried out in the San Joaquin Valley between 1996 and 2000, Hutmacher and collaborators found that the residual nitrate–N level in spring can be fully subtracted from the crop N requirements to determine the amount of fertilizer N that needs to be applied [N16]. Petiole analyses are used to monitor the N status of cotton after the first squares stage. A representative sample of 30 to 40 petioles should be collected at random. Generally, the petiole that is third to fifth from the terminal on the main stem is selected. This petiole should have a fully expanded leaf blade [N2, N24]. Samples should be sent to the laboratory immediately or dried without delay. For more information on sampling procedure see Plant Tissue Sampling. Petiole nitrate levels need to be interpreted with care because they not only depend on N availability, but also on variety, growth stage, soil type, weather, and insect damage [N10]. The concentration of nitrate in petioles generally declines rapidly after first bloom. Taking petiole samples at first bloom, peak bloom, and at first open boll to monitor the change in petiole nitrate over time may help to overcome the confounding effects of variety and soil type [N2]. Nitrate concentrations in petioles are slightly higher early in the morning. The values should be adjusted down by 10% when petioles are sampled before 7 a.m., and by 5% when sampled between 7 and 8 a.m. [N31]. The nitrate level should fall below 2000 ppm nitrate-N late in the season for best defoliation and harvestability [N2]. The results of late-season petiole analyses may be known too late to make corrections for the current crop. However, they can be used to evaluate the fertilization program and make corrections for the following year. High preplant N applications have generally no beneficial effect on yield compared to well-timed sidedress applications, but may result in lower yields [N6, N34, N35]. This can be explained by the fact that only a small proportion, generally less than 15-25% of the total N is taken up by the cotton plant during the first two months after planting [N1, N9]. Therefore, preplant N remains in the root zone for a relatively long time before being taken up by the plants. This increases the risk of N leaching below the root zone, especially in furrow irrigated systems. Applying moderate levels of N before or at planting and sidedressing the rest minimizes the risk of N losses. Starter fertilizers are an effective way of providing sufficient N and phosphorus to young plants. Starter fertilizer strengthen the root system and encourage early rapid growth necessary to compete with weeds [N7]. However, these beneficial effects do not always translate into higher yields [N3, N13, N29]. Starter fertilizer are most beneficial when cool weather slows down germination and early plant growth or in soils that fix P or K [N3, N21]. Under conditions, where starter fertilizer has a positive effect, a yield increase of up to 10% may be achieved [N13, N32]. Early in the season, the N requirement of cotton is low [N1, N9, N31]. Therefore, high starter application rates are not needed. Application rates generally range from 5 to 35 lbs N/acre and 20 to 60 lbs P2O5/acre [N3, N4, N13]. The higher N rates may be appropriate for soils with residual nitrate levels below 50 lbs N/acre. High application rates may have negative effects on seedling development because increased salt concentrations inhibit the young expanding roots near the application band, which make it more difficult for the seedling to extract water and nutrients. When starter fertilizer is applied at a distance of more than 2 inches from the seed, the amount of N plus K2O that can be applied safely is 20 and 40 lbs/acre in sandy and fine-textured soil, respectively [N5]. However, in dry, sandy soils, application rates exceeding 15 lbs N/acre may already increase the risk of seedling damage [N7]. The most common placement for starter fertilizer is 2 inches to the side and 2 inches below the seed drill [N3, N13, N17]. Side banded application is favorable to broadcast application, even when the latter is shallowly incorporated [N12, N13], or to deep placement (6 to 10 inches below the seed) [N30]. Starter fertilizer should not be placed in direct contact with the seed in the furrow due to salt effects (see Application Rate). Liquid fertilizers that contain N and P, such as 10-34-0 (ammonium polyphosphate), are most commonly used as starter fertilizers [N3, N12, N13]. Dry fertilizer materials can also give good results [N7]. 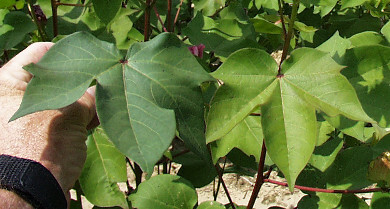 Fertilizers that release ammonia, such as anhydrous ammonia, UAN, urea, or ammonium sulfate, should be avoided because ammonia is highly toxic to the cotton plant, especially to seedlings [N17, N31]. In a FREP-supported study carried out in the San Joaquin Valley between 1996 and 2000, Hutmacher and collaborators found that about 1300 lbs lint/acre can be produced with 180 to 200 lbs available N per acre [N15]. The available N includes residual soil nitrate–N in the top 2 feet of the profile and that applied with fertilizers. Their study showed that the residual nitrate–N level in spring can be fully subtracted from the crop N requirements to determine the amount of fertilizer N that needs to be applied. These findings are in line with field trials carried out at the University of California West Side Field Station, where lint yield did not respond to N fertilization when the amount of residual nitrate-N in the top three feet of the soil exceeded 200-225 lbs/acre [N36]. The N requirement of cotton strongly depends on the yield target. The N fertilization rates for different cotton yield levels grown in soils with nitrate-N levels below 50 lbs/acre are listed below [N31]. 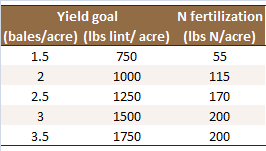 Approaches to determine a realistic yield goal are discussed here. Nitrogen application rates based on expected yield. The rates in the table need to be corrected for residual soil N [N31]. Another factor that needs to be considered is the type of cotton grown. In general, N application rates to Pima cotton are lower compared to Acala cotton due to slightly lower yields and the sensitivity of Pima cotton to excess N [N26]. A 2-year study in the San Joaquin Valley found no increase in Pima cotton yield when available N (residual soil nitrate-N plus fertilizer N) exceeded 150 lbs/acre [N8, N23]. Contact your local farm advisor for more information. The optimal fertilizer rate also depends on the fertilizer application costs relative to the price of cotton. The maximum yield is generally not the most profitable yield, as the yield increase diminishes with each additional pound of N added. Therefore, the economically optimal yield may be considerably below the maximum yield. A discussion about the economically optimal yield can be found here. Nitrogen fertilizers can be surface-applied or injected into the soil beneath the surface. Injecting the fertilizers into the soil ensures that it is immediately accessible to plant roots. Except for sprinkler irrigation systems, surface applied fertilizers may remain on the soil surface for some time, delaying the availability to plants. In addition, surface-applied fertilizers containing urea or ammonium are prone to ammonia volatilization, especially when the soil pH is above 7 [N31]. A wide range of mineral N fertilizers is available (see Table). Generally, nitrate is the most readily available N form, followed by ammonium and urea. However, in warm and moist soil, hydrolysis of urea to ammonium and nitrification of ammonium to nitrate is rapid, taking only a few days to complete [N31]. The solid fertilizers on the list below are all highly soluble and can be dissolved in water for use in fertigation. Common N fertilizers used for cotton [N31]. Until the early square stage, cotton plants require little N. Uptake rates between early square and peak bloom, however, are high [N9]. During this period, a high N supply is crucial for high yield potentials. Soil N applications should be completed by midbloom, as excessive and late N application can delay maturity, resulting in more difficult defoliation and a later harvest [N31]. Therefore, for optimal utilization, most fertilizer N should be applied between early squaring and peak bloom [N27]. Splitting larger N applications has the advantages that the total N requirements of the plants can be estimated more accurately at a later time based on fruit load and that the risk of N leaching losses is reduced [N14]. Foliar fertilizers are best used to supplement soil-applied N in order to correct for N deficiencies during boll development [N22, N25]. While N deficient plants respond to foliar N [N22, N33], yield of plants with an adequate N supply is generally not increased. Therefore, foliar N is applied when petiole levels or crop development indicates that the need for N exceeds the plant’s capacity to take up N from the soil and when it is too late in the season to side-dress N [N22]. However, foliar N should be applied before deficiency symptoms develop [N22]. Up to three applications with rates of 6-10 lbs N/acre per application have been shown to be effective [N18]. Urea is the most popular form of N used as foliar fertilizer in cotton [N10, N22]. Ammonium toxicity can be avoided by buffering the solution to a pH of 6.5 to 7 [N18]. Foliar applications are generally made between peak and late bloom. During this period, soil-applied N would promote excessive late-season vegetative growth [N19, N20]. Absorption rates are highest and the risk of leaf burn lowest when foliar N is applied in the late afternoon or early morning. Water stress may reduce N absorption [N10, N18, N22]. Therefore, the crop should be well watered. Phosphorus deficiency results in stunted growth and impacts the ability to take up nutrients. Deficient plants have dark green leaves and, in some cases, the leaves and stems turn purple. As phosphorus is mobile in plants, P deficiency symptoms first appear on older leaves. Leaves of P deficient plants senesce often prematurely. In addition, flowering, fruiting and maturity are delayed as a result of P deficiency [P5, P6]. Phosphorus deficiency symptoms on cotton leaves (photo provided by the International Plant Nutrition Institute. Excessive P application may reduce Zn uptake, inducing Zn deficiency [P5]. Soil samples should be taken in spring from the first or second foot of soil (see Soil Test Sampling Instructions). In California, plant available P is generally determined by extracting soil samples with sodium bicarbonate (Olsen-P). Olsen-P concentrations of less than 3-5 ppm are considered low and a yield response to fertilizer P is likely [P17, P21, P25]. In contrast, when the concentration is higher than 8 ppm, a yield response is unlikely (see Table). Interpretation of soil test values. When the soil P test level is high, a small starter application may be considered when the growth conditions are suboptimal (e.g. cool weather conditions). When the Olsen-P test indicates moderate P availability, the main goal of P fertilization is to maintain the current level of P availability by replacing the P removed from the field with seeds and lint, which ranges from 9 to 22 lbs P/acre (20-50 lbs P2O5/acre) for high-yielding cotton [P7, P10, P22]. These amounts are in line with several studies, where application rates ranging from 20 to 60 lbs P2O5/acre were reported [P3, P4, P11]. The P contents in the aboveground biomass ranges from 18 to 40 lbs P/acre (40-90 lbs P2O5/acre) [P7, P10, P22]. This amount of P may be applied when the P soil test indicates low P availability. By applying more P than is removed at harvest, the soil P test level should increase over the years, reaching the intermediate level. Contact your local farm advisor for more information. If P deficiency is suspected early in the season, the entire aboveground biomass of young plants can be sampled. Deficiency symptoms occur when tissue phosphate-P levels are below 400 ppm [P15]. Later in the season, the petiole from the youngest fully expanded leaf on the main-stem is usually sampled. This is the third to fifth leaf from the terminal and the most active [P1, P20]. A representative sample of 30 to 40 petioles should be collected at random [P1]. Petiole P levels can be determined on the same sample taken for nitrate or potassium analysis [P14]. For more information on sampling procedure see Plant Tissue Sampling. Phosphorus concentrations (in ppm phosphate-P) in petioles [P1]. The phosphate-P content in the petioles should be maintained above 1000 ppm during the main fruiting period [P1]. At the time petiole analyses are done, it may no longer be possible to correct P availability. Therefore, petiole P analyses are mainly used to assess the P fertilization management for adjustments in the following years. 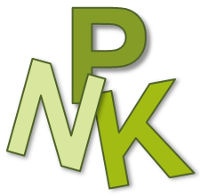 High petiole P concentrations do not necessarily indicate abundant P availability, as other factors, such as acute N deficiency can result in an accumulation of P in the petiole [P1]. Petiole P concentrations should therefore be interpreted together with other nutrients. The optimum time to apply P to cotton is at planting [P12]. Phosphorus may be applied preplant when the soil P test level is intermediate to high and the goal of fertilization is to maintain the current level of P availability (for more details, see Soil Test). Band applications of P are generally more effective than broadcast applications. This is especially true in soils with an alkaline (>7.5) or acidic pH (<5.5). Phosphorus availability highly depends on soil pH. In acidic soils, P may be fixed by aluminum and iron oxide minerals, while fixation by calcium is increased at high pH. Fixation is less of a problem in neutral soils or acidic soils with a high sand content. Under these conditions, a broadcast application is possible [P13]. Starter fertilizers are an effective way of providing early nutrients. Starter fertilizer may strengthen the root system and encourage early rapid growth to compete with weeds [P8, P18]. However, these advantages do not always translate into higher yields [P3, P11, P23, P26]. Starter fertilizer may be most beneficial in years where cool weather after planting slows down germination and early plant growth or in soils that fix P [P3, P16]. In contrast, in soils with very high soil test P levels, starter P application may not have an effect on cotton yield and growth [P4]. Under conditions, where starter fertilizer has a positive effect, a yield increase of up to 10% may realistically be expected [P11, P25]. Application rates depend on the soil test level (Table, for more details see Soil Test). The most common placement of the starter fertilizer is in a band 2 inches to the side and 2 inches below the seed drill [P3, P11, P13]. Starter fertilizer should not be placed in direct contact with the seed in the furrow due to salt effects. Excess salt will negatively impact root growth and uptake of essential nutrients. Side banded application is favorable to broadcast application, even when the latter is shallowly incorporated [P9, P11] or to deep placement at 6 to 10 inches below the seed [P24]. A broadcast application of P is especially unfavorable on calcareous soils with a pH of 8 or higher because of P fixation by calcium and on acidic soils where P may be fixed by aluminum and iron oxide minerals [P13]. Liquid fertilizers that contain N and P, such as 10-34-0 (ammonium polyphosphate) are most commonly used as starter fertilizers [P3, P9, P11]. Dry fertilizer materials, such as triple superphosphate, can also give good results [P8]. The optimal time to apply P to cotton is at planting. However, when deficiency symptoms indicate suboptimal P supply, a sidedress application should be attempted. Johnson Hake and coauthors recommend shanking in ammonium phosphate as close to the active root zone as possible at rates of 50 to 75 lbs of P2O5/acre [P14]. When P availability (from soil or fertilizer) is adequate, foliar P applications generally have no positive effect on cotton lint yield. In a soil at the Westside Field Station which was not considered deficient in either P or K, Zelinski and coworkers found that foliar application of these two nutrients had no effect on lint yield [P26]. This is in line with Bednarz and coworkers who found that foliar fertilization with N and P (applied as urea phosphate or ammonium polyphosphate) had little effect on yield and plant P concentrations of cotton grown on soils that were P fertilized based on soil test recommendations [P2]. Potassium deficiency symptoms generally become visible after flowering and intensify during the boll set period [K25]. Symptoms include a yellowish white mottling of the foliage and yellow spots appearing between the veins of the leaves, with the leaf tips and margins being first affected (see picture). When the centers of the spots die, they turn into brown specks. Leaf tips curl downwards. Under severe K deficiency, the leaves turn reddish brown, dry and drop prematurely [K6]. Potassium deficiency may also affect boll development and fiber quality [K5]. 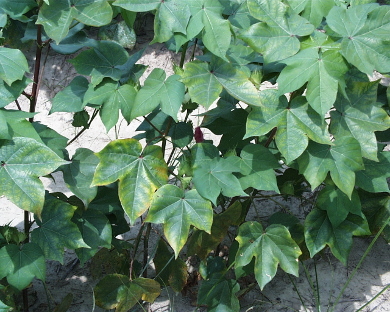 Potassium deficiency symptoms on cotton leaves (photo provided by the International Plant Nutrition Institute. Potassium is a mobile element in the plant. Deficiency symptoms therefore should appear first on older leaves [K25]. In the field, however, symptoms are often seen on younger leaves [K24]. Symptoms of potassium deficiency have been widely observed for cotton grown on soils in the San Joaquin valley derived from Sierra Nevada alluvium. These soils tend to fix K [K20] (see K Fixation in the San Joaquin Valley). For soils that fix K, the extraction with ammonium acetate is not a reliable measure for available K [K20] (see K Fixation in the San Joaquin Valley). A K fixation measurement should be considered for soils located within the area identified as potentially K fixing when the exchangeable K values are between 50 and 200 ppm. Soils from this area with exchangeable K test levels below that range are very likely to fix K, while soils with higher values generally do not fix K [K20]. Petiole analyses can be used to determine the K status of the crop (see Table). The petiole from the youngest fully expanded leaf on the main-stem is usually sampled. This is the third to fifth leaf from the terminal and the most active [K2, K21]. A representative sample of 30 to 40 petioles should be collected at random [K2]. For more information on sampling procedure see Plant Tissue Sampling. The K concentration in the petioles decreases almost linearly after bloom by about 1% every 16 days [K2, K25]. Petiole K concentrations also depend on the variety and may vary from one year to another [K16]. 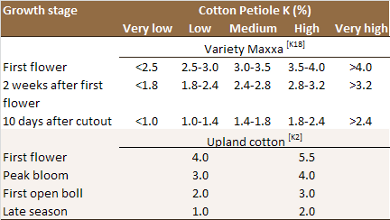 Therefore, the levels shown in the table below are only general guidelines and knowledge about the fields and experience with the cotton variety grown are important for the interpretation of petiole K levels for a particular location and soil. The levels reported as “low” by Bassett and MacKenzie are identical to the sufficiency levels reported by Oosterhuis who based the recommendation on several studies [K2, K19]. Results from late-season petiole analyses may be known too late to make corrections for the current crop. However, they are helpful for evaluating the current fertilization management and to make adjustments for the following year [K16, K23]. The amount of K removed at harvest with lint and seeds ranges from 35 to 60 lbs K/acre (40-70 lbs K2O/acre) for high-yielding cotton [K9, K10, K22]. The K in the aboveground biomass is considerably larger, ranging from 160 to 220 lbs K/acre (190-270 lbs K2O/acre) [K7, K9, K10]. Potassium fertilizer is most often broadcast before discing and bedding up or banded on the shoulder of the bed to a depth of 6 to 8 inches [K17]. As the cotton root system in the surface soil is weak, it is important to incorporate the fertilizer [K12]. In soils with a high K fixation potential, a band application, 6 to 8 inches deep, may be more efficient than a broadcast application, as the contact with soil minerals is reduced [K13]. Both, muriate of potash (KCl; potassium chloride) and sulfate of potash (K2SO4; potassium sulfate) can be applied to cotton. Muriate of potash is most often used, as it is cheaper and cotton is tolerant to chlorine [K25]. Potassium is most often added preplant. In sandy soils with a low cation exchange capacity, multiple annual applications may be required, as K can be leached. Split applications may also be beneficial in soils that tend to fix K.
Cotton tends to be more sensitive to low K availability than most other major field crops due to its relatively low root density [K19]. Therefore, when cotton is grown in rotation with other crops, and K is not applied on an annual basis, it is recommended to apply K before cotton. Potassium is not commonly applied as a starter fertilizer. However, applying starter K may be beneficial in soils that fix K.
The amount of K that con be applied as a starter is limited, as high K application rates may have negative effects on seedling development because of increased salt concentrations in the soil near the application band. According to the Western Fertilizer Handbook, when starter fertilizer is applied at a distance of more than 2 inches from the seed, the amount of N plus K2O that can be applied safely is 20 and 40 lbs/acre in sandy and fine-textured soil, respectively [K4]. Contact your local farm advisor for more information. The most common placement for starter fertilizer is 2 inches to the side and 2 inches below the seed drill [K3, K11, K14]. Starter fertilizer should not be placed in direct contact with the seed in the furrow due to salt effects. Liquid fertilizers that contain N and P, such as 10-34-0 (ammonium polyphosphate) are most commonly used as starter fertilizers [K3, K8, K11]. In K fixing soils, e.g. on the east side of the San Joaquin Valley, starter fertilizers containing K may be beneficial. Contact your local farm advisor for more information. Potassium is most often applied preplant. In sandy soils with a low cation exchange capacity, however, multiple annual applications may be required, to minimize leaching losses. Split applications may also be beneficial in soils that tend to fix K (see Soil K Test). The sidedress application rate equals the K fertilizer recommendation, which is based on the soil test result, minus the quantities applied preplant and as starter. The fertilizer should be placed below the bottom of the irrigation furrow, as the mobility of K in the soil is limited and plants have restricted access to K in dry surface soil [K15]. Both muriate of potash (KCl) and sulfate of potash (K2SO4) can be used for cotton. Muriate of potash is most often used, as it is cheaper and cotton is tolerant to chlorine [K25]. The period of high daily uptake rates begins after first bloom [K1]. Therefore, the last split application should be done before first bloom [K15], so that the K is available when the plants need it. Deficiencies occurring after first bloom can be addressed with foliar applications. Late in the season, foliar applications are generally more effective than water-run applications. This is especially true when the K supply of the plant is limited by a poor root system due to diseases, root damage or soil conditions restricting rooting depth. In soils that fix K, foliar applications may also be beneficial [K17,K25]. If the petiole test indicates suboptimal K supply, two foliar applications of 10 lbs K2O/acre at 7 and 14 days after first flower are recommended [K17]. The recommended source of K for foliar application is potassium nitrate, however, potassium sulphate and potassium thiosulfate seem to be similarly effective [K19]. Bassett, D.M., Anderson, W.D., Werkhoven, C.H.E., 1970. Dry matter production and nutrient uptake in irrigated cotton (Gossypium hirsutum). Agronomy Journal 62, 299-303. Bassett, D.M., MacKenzie, A.J., 1976. Plant analysis as a guide to cotton fertilization. In: Reisenauer, H.M. (Ed.) Soil and Plant-Tissue Testing in California. University of California Cooperative Extension Bulletin 1879. pp. 16-17. Bednarz, C.W., Harris, G.H., Shurley, W.D., 2000. Agronomic and economic analyses of cotton starter fertilizers. Agronomy Journal 92, 766-771. Cahill, S., Johnson, A., Osmond, D., Hardy, D., 2008. Response of corn and cotton to starter phosphorus on soils testing very high in phosphorus. Agronomy Journal 100, 537-542. Constable, G.A., Rochester, I.J., 1988. Nitrogen application to cotton on clay soil: timing and soil testing. Agronomy Journal 80, 498-502. Extension Cotton Team, 2012. 2012 Georgia cotton production guide. Fritschi, F.B., Roberts, B.A., Travis, R.L., Rains, D.W., Hutmacher, R.B., 2003. Response of irrigated Acala and Pima cotton to nitrogen fertilization: growth, dry matter partitioning, and yield. Agronomy Journal 95, 133-146. Fritschi, F.B., Roberts, B.A., Travis, R.L., Rains, D.W., Hutmacher, R.B., 2004. Seasonal nitrogen concentration, uptake, and partitioning pattern of irrigated Acala and Pima cotton as influenced by nitrogen fertility level. Crop Science 44, 516-527. Gerik, T.J., Oosterhuis, D.M., Torbert, H.A., 1998. Managing cotton nitrogen supply. Advances in Agronomy 64,115-147. Godfrey, L.D., Hutmacher, R.B., 2001. Interaction of cotton nitrogen fertility practices and cotton aphid population dynamics in California cotton. FREP Final Report. Guthrie, D.S., 1991. Cotton response to starter fertilizer placement and planting dates. Agronomy Journal 83, 336-839. Hutchinson, R.L., Howard, D.D., 1997. Response of no‐tillage and conventional‐tillage cotton to starter fertilization on loess soils. Journal of Plant Nutrition 20, 975-986. Hutmacher, R.B., 2012. California cotton: split or don't split nitrogen? Hutmacher, R.B., Travis, R.L., Rains, D.W., Vargas, R.N., Roberts, B.A., Weir, B.L., Wright, S.D., Munk, D.S., Marsh, B.H., Keeley, M.P., Fritschi, F.B., Munier, D.J., Nichols, R.L., Delgado, R., 2004. Response of recent Acala cotton varieties to variable nitrogen rates in the San Joaquin Valley of California. Agronomy Journal 96, 48-62. Hutmacher, R.B., Travis, R.L., Roberts, B.A., Keeley, M.P., Delgado, R., 2005. Residual soil nitrogen and nitrogen management for Acala cotton. FREP Final Report. Johnson Hake, S., Hake K.D., Kerby T.A., 1996c. Preplant-spring. In: Hake, S.J., Kerby T.A., Hake, K.D. (Eds.) Cotton Production Manual. University of California, Division of Agriculture and Natural Resources, Publication 3352. pp. 15-20. Johnson Hake, S., Hake K.D., Kerby T.A., 1996d. Prebloom decisions. In: Hake, S.J., Kerby T.A., Hake, K.D. (Eds.) Cotton Production Manual. University of California, Division of Agriculture and Natural Resources, Publication 3352. pp. 29-50. Johnson Hake, S., Hake K.D., Kerby T.A., 1996e. Early to mid-bloom decisions. In: Hake, S.J., Kerby T.A., Hake, K.D. (Eds.) Cotton Production Manual. University of California, Division of Agriculture and Natural Resources, Publication 3352. pp. 51-63. Johnson Hake, S., Hake K.D., Kerby T.A., 1996f. Mid- to late-bloom decisions. In: Hake, S.J., Kerby T.A., Hake, K.D. (Eds.) Cotton Production Manual. University of California, Division of Agriculture and Natural Resources, Publication 3352. pp. 64-72. Maples, R.J., and J.L. Keogh, 1973. Phosphorus fertilization experiments with cotton on Delta soils of Arkansas. Arkansas Agricultural Experimental Station Bulletin 781. Rains, W., Travis, R.L., Hutmacher, R., 2001. Nitrogen budget in California cotton cropping systems. FREP Final Report. Reddy, K.R., Hodges, H.F., Varco, J., 2000. Potassium nutrition of cotton. Mississippi Agricultural and Forestry Experiment Station Bulletin 1049. Roberts, R.K., Kenty, M.M., Thomas, J.M., Howard, D.D., 2006. Economic evaluation of soil and foliar applied nitrogen fertilization programs for cotton production. The Journal of Cotton Science 10, 193-200. Silvertooth, J.C., 2001. Agronomic guidelines for Pima cotton production in Arizona. University of Arizona Cooperative Extension Bulletin 1242. Silvertooth, J.C., Edmisten, K.L., McCarthy, W.H., 1999. Production practices. In: Smith, C.W., Cothren, J.T. (Eds.) Cotton - Origin, History, Technology, and Production. John Wiley & Sons, Inc. pp. 451-488. Silvertooth, J.C., Norton, E.R., 2011. Management of fertilizer nitrogen in Arizona cotton production. University of Arizona Cooperative Extension Bulletin 1243. Stewart, A.M., Edmisten, K. L., 1998. Cotton response to placement and rate of starter fertilizer. Journal of Plant Nutrition 21, 967-973. Touchton, J.T., Ricker, D.H., Burmester, C.H., Reeves, D.W., 1986. Starter fertilizer combinations and placement for conventional and no-tillage cotton. Journal of Fertilizer Issues 3, 91-98. Weir, B.L., Kerby, T.A., Hake, K.D., Roberts, B.A., Zelinski, L.J., 1996. Cotton fertility. In: Hake, S.J., Kerby T.A., Hake, K.D. (Eds.) Cotton Production Manual. University of California, Division of Agriculture and Natural Resources, Publication 3352. pp. 210-227. Weir, B., Miller, R., Hutmacher, R.B., Hufaker, R., Travis, R., Vargas, R., Munk, D., Wright, S., Roberts, B., Munier, D., 1997. Establishing updated guidelines for cotton nutrition. FREP Final Report. Wiedenfeld, B., Wallace, B.W., Hons, F., 2009. Indicators of cotton nitrogen status. Journal of Plant Nutrition 32, 1353-1370. Yang, G., Tang, H., Nie, Y., Zhang, X., 2011. Responses of cotton growth, yield, and biomass to nitrogen split application ratio. European Journal of Agronomy 35, 164-170. Yang, G., Tang, H., Tong, J., Nie, Y., Zhang, X., 2012. Effect of fertilization frequency on cotton yield and biomass accumulation. Field Crops Research 125, 161-166. Zelinski, L.J., 1985. Development of a soil nitrogen test for cotton. Proceedings of the Beltwide Cotton Production Research Conference, New Orleans, LA. National Cotton Council of America. pp. 304-306. Bednarz, C.W., Hopper, N.W., and Hickey, M.G., 1999. Effects of foliar fertilization of Texas southern high plains cotton: Leaf phosphorus, potassium, zinc, iron, manganese, boron, calcium, and yield distribution, Journal of Plant Nutrition 22, 863-875.
Cooper, H.P., 1940. Nutritional deficiency symptoms in cotton. Proceedings of the Soil Science Society of America 4, 322-324. Dorahy, C.G., Rochester, I.J., and Blair, G.J., 2004. Response of field-grown cotton (Gossypium hirsutum L.) to phosphorus fertilization on alkaline soils in eastern Australia. Australian Journal of Soil Research, 42, 913-920. Johnson Hake S., Hake K.D., Kerby T.A., 1996a. Postharvest-Fall. In: Hake, S.J., Kerby T.A., Hake, K.D. (Eds.) Cotton Production Manual. University of California, Division of Agriculture and Natural Resources, Publication 3352. p. 1-5. Johnson Hake, S., Hake, K.D., Kerby, T.A., 1996b. Preparation for the new crop season - fall/winter. In: Hake, S.J., Kerby T.A., Hake, K.D. (Eds.) Cotton Production Manual. University of California, Division of Agriculture and Natural Resources, Publication 3352. pp. 6-14. Mikkelsen D.S., 1955. Cotton phosphate fertilization: New soil test provides reliable and easily applied diagnostic guide to quantity of available phosphate. California Agriculture 9, 7-15. Mullins, G.L., 1993. Cotton root growth as affected by P fertilizer placement. Fertilizer Research 34, 23-26. Norton, E.R. and Silvertooth, J.C., 2006. A review of 10 years of phosphorus fertility research in Arizona. Arizona Cotton Report 2006, 289-279. Reisenauer, H.M., Quick, J., Voss, R.E., 1976. Soil test interpretive guides. In: Reisenauer, H.M. (Ed.) Soil and Plant-Tissue Testing in California. University of California Cooperative Extension Bulletin 1879. pp. 38-40. Rochester, I.J., 2010. Phosphorus and potassium nutrition of cotton: interaction with sodium. Crop and Pasture Science 61, 825-834. Cassman, K.G., Kerby, T.A., Roberts, B.A., Bryant, D.C., Higashi, S.L., 1990. Potassium nutrition effects on lint yield and fiber quality of Acala cotton. Crop Science 30, 672-677. Dong, H., Kong, X., Li, W., Tang, W., Zhang, D., 2010. Effects of plant density and nitrogen and potassium fertilization on cotton yield and uptake of major nutrients in two fields with varying fertility. Field Crops Research 119, 106-113. Halevy, J., Marani, A., Markovitz, T. 1987. Growth and NPK uptake of high-yielding cotton grown at different nitrogen levels in a permanent-plot experiment. Plant and Soil 103, 39-44. Hutmacher, R.B., Keeley, M.P., Davis, K.R., Ayars, J.E., Peters, M.S., Vail, S.S., Covarrubias, J., Nevarez, A., 1999. Cotton root system in a clay loam soil: effects of growth stage, irrigation and nitrogen treatment. Proceedings of the Beltwide Cotton Conference 1999, 637-640. López, M., de Castro, A., Gutiérrez, J.C., and Leidi, E.O., 2010. Nitrate and potassium concentrations in cotton petiole extracts as influenced by nitrogen fertilization, sampling date and cultivar. Spanish Journal of Agricultural Research 8, 202-209. Miller, R., Weir, B., Vargas, R., Wright, S., Travis, B., Roberts, B., Rains, B., Munk, D., Munier, D., and Kerby, M., 1996. Cotton potassium fertility guidelines for the San Joaquin Valley of California. University of California, Division of Agriculture and Natural Resources, Publication 21562. Oosterhuis, D.M. 2002. Potassium management of cotton. In: Pasricha, N.S., Bansal, S.K. (Eds.) Potassium for Sustainable Crop Production. International Potash Institute, Basel, Switzerland and Potash Research Institute of India, Gurgaon, Haryana. pp. 321-346. Sabbe, W.E., Zelinski, L.J., 1990. Plant analysis as an aid in fertilizing cotton. In: Westerman, R.L. (Ed.). Soil Testing and Plant Analysis. Soil Science Society of America, Madison, WI. pp. 469-493. Stromberg, K., 1960. Need for potassium fertilizer on cotton determined by leaf and soil analyses. California Agriculture 14, 4-5.